Melt chocolate (čokoláda) of your choice (baking chocolate or a chocolate bar) by placing it in a small pot, which you in turn place in a larger pot containing boiling water. This is done so that the chocolate melts without burning. You can alternatively try the microwave. 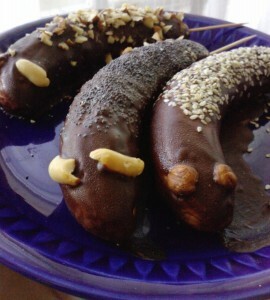 Then when the chocolate is melted, simply dip in it peeled bananas (banány). Cover them right away with your choice of toppings: sliced almonds (sekané mandle), poppy seeds (mak), or sesame seeds (sézamové semienka) work great. Poke a toothpick in one end and enjoy. Ah, the bananky… I grew up in Serbia and we have the same thing there. I have never found anything similar un England so we rely on visit to/from home for good supply of those. In recent years they are used for making cakes as well (eg you would make no-bake rolat with bananky in the middle-very effective when sliced). Have you ever come across similar recipes? Your comment made me crave the chocolate bananas so bad, I had to go to the local European shop to get some. Now I have authentic chocolate covered bananas in Canada! Mmmm! (no, I’m not rubbing it in). But I love them. And rumove pralinky! I love those too, but I’ll have to wait until my next trip to Toronto to look for those.